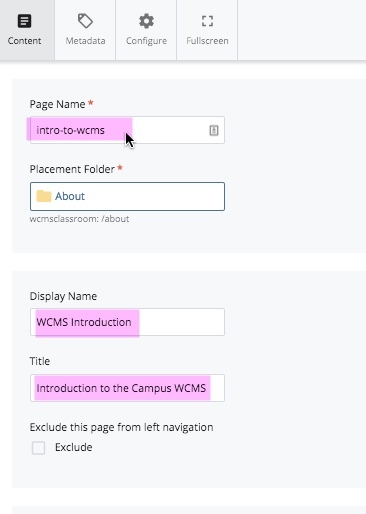 ***If your page name has a space in it, the published URL will turn that space into a "%20" so you'd end up with a URL like "www.ucsc.edu/about%20us/contact%20us.html"
To change the Display Name or Title, click the "Edit" tab. Note: Index pages are a special case. Every folder that is published must have a page in with the page name "index." 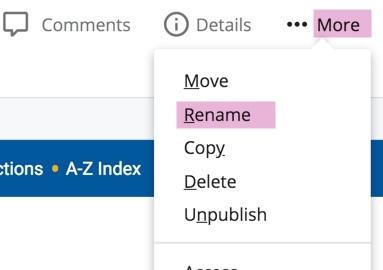 These pages can have their own Display Name and Title, like any other page, but the page name must be "index" for the contents of the folder to display properly. Index pages show the folder's display name.